Olympian's Gil Warren will retire at the end of the school year. CHULA VISTA  In the fall of 2005, Gil Warren cleaned out his garage. He tinkered around the house. He drove up Interstate 5 to Washington. His son has a cabin there. Along the way, he stopped in Lake Oswego, Ore. It was a Friday night and there was a high school football game being played. He sat in the stands and took in the sights and sounds he had come to miss. On his way back from Washington, he stopped in Lake Oswego again. It was another Friday night. He accepted Olympian High’s head football coaching job in early 2006. His one-year break was over. He’d retired after leading Southwest in 2004. On Monday morning, Warren told his players his storied career was over. The South Bay fixture will retire at the end of the school year. This time, he may not come back. Warren has un-retired multiple times since he took his first head coaching job at Castle Park in 1967. The Eagles’ season ended Friday with a loss to Lincoln in the Division III semifinals. They finished at 11-1 and have gone 49-20 over their first five varsity seasons, all under Warren. Warren’s record over 28 seasons, all in the South Bay: 215-88-5. 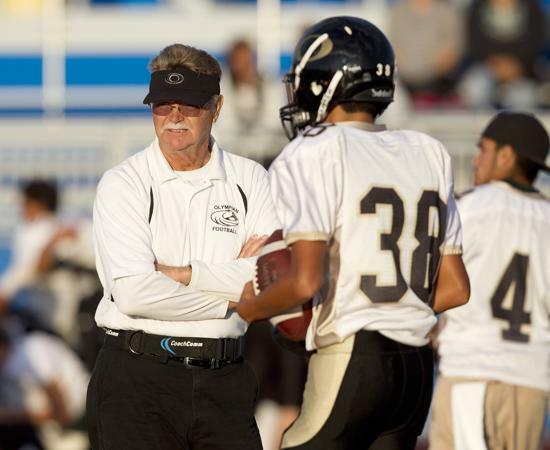 He is one of only seven San Diego Section coaches to win 200 games. He won section titles with Castle Park in 1968, 1994 and 1996. The search for a new head coach has already begun, Leano added. Reldon “Bing” Dawson, Warren’s longtime defensive coordinator, will stay on with the Eagles. In 1969, Warren hired Dawson, a fellow ex-San Diego State football player. The two have coached together at Castle Park, Southwestern College and Olympian. “How many times has he left me? Quite often,” Dawson said, chuckling. “Probably about six or seven times, but we’ve always been resurrected together. “I don’t think we’ll be resurrected this time. Warren said he plans to travel and get away from football. But Tuesday, he took a moment to reflect on the highlights of his career. He mentioned 2002, the year he debuted with a 3-6-1 record at Southwest. The Raiders broke a 40-game losing streak that season. “We changed the attitude and the pride there,” Warren said. He also mentioned Olympian, which has gone from playing a junior varsity schedule in 2006 to competing as a South Bay power. Senior quarterback Christopher Humphery was a part of the last two championships. “I had a feeling it was gonna happen,” Humphery said of Warren’s announcement to his players, “but it just felt kinda surreal.